The promise of wearables, functional fabrics, the Internet of Things, and their "next-generation" technological cohort seems tantalizingly within reach. But researchers in the field will tell you a prime reason for their delayed "arrival" is the problem of seamlessly integrating connection technology – namely, antennas – with shape-shifting and flexible "things." But a breakthrough by researchers in Drexel's College of Engineering, could now make installing an antenna as easy as applying some bug spray. "This is a very exciting finding because there is a lot of potential for this type of technology," said Kapil Dandekar, PhD, a professor of Electrical and Computer Engineering in the College of Engineering, who directs the Drexel Wireless Systems Lab, and was a co-author of the research. "The ability to spray an antenna on a flexible substrate or make it optically transparent means that we could have a lot of new places to set up networks – there are new applications and new ways of collecting data that we can't even imagine at the moment." The researchers, from the College's Department of Materials Science and Engineering, report that the MXene titanium carbide can be dissolved in water to create an ink or paint. The exceptional conductivity of the material enables it to transmit and direct radio waves, even when it's applied in a very thin coating. "We found that even transparent antennas with thicknesses of tens of nanometers were able to communicate efficiently," said Asia Sarycheva, a doctoral candidate in the A.J. Drexel Nanomaterials Institute and Materials Science and Engineering Department. "By increasing the thickness up to 8 microns, the performance of MXene antenna achieved 98 percent of its predicted maximum value." Preserving transmission quality in a form this thin is significant because it would allow antennas to easily be embedded – literally, sprayed on – in a wide variety of objects and surfaces without adding additional weight or circuitry or requiring a certain level of rigidity. "This technology could enable the truly seamless integration of antennas with everyday objects which will be critical for the emerging Internet of Things," Dandekar said. "Researchers have done a lot of work with non-traditional materials trying to figure out where manufacturing technology meets system needs, but this technology could make it a lot easier to answer some of the difficult questions we've been working on for years." Initial testing of the sprayed antennas suggest that they can perform with the same range of quality as current antennas, which are made from familiar metals, like gold, silver, copper and aluminum, but are much thicker than MXene antennas. Making antennas smaller and lighter has long been a goal of materials scientists and electrical engineers, so this discovery is a sizeable step forward both in terms of reducing their footprint as well as broadening their application. "Current fabrication methods of metals cannot make antennas thin enough and applicable to any surface, in spite of decades of research and development to improve the performance of metal antennas," said Yury Gogotsi, PhD, Distinguished University and Bach professor of Materials Science and Engineering in the College of Engineering, and Director of the A.J. Drexel Nanomaterials Institute, who initiated and led the project. "We were looking for two-dimensional nanomaterials, which have sheet thickness about hundred thousand times thinner than a human hair; just a few atoms across, and can self-assemble into conductive films upon deposition on any surface. Therefore, we selected MXene, which is a two-dimensional titanium carbide material, that is stronger than metals and is metallically conductive, as a candidate for ultra-thin antennas." "The MXene antenna not only outperformed the macro and micro world of metal antennas, we went beyond the performance of available nanomaterial antennas, while keeping the antenna thickness very low," said Babak Anasori, PhD, a research assistant professor in A.J. Drexel Nanomaterials Institute. "The thinnest antenna was as thin as 62 nanometers – about thousand times thinner than a sheep of paper – and it was almost transparent. 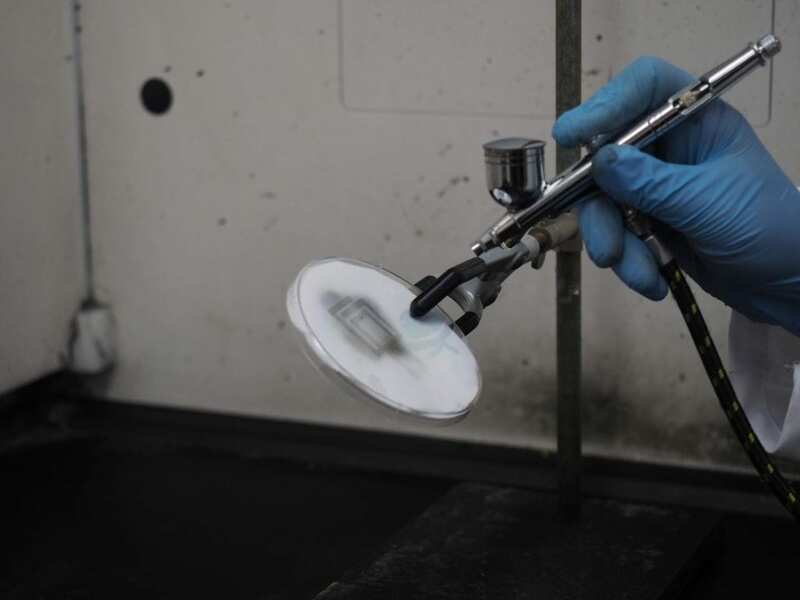 Unlike other nanomaterials fabrication methods, that requires additives, called binders, and extra steps of heating to sinter the nanoparticles together, we made antennas in a single step by airbrush spraying our water-based MXene ink." The group initially tested the spray-on application of the antenna ink on a rough substrate – cellulose paper – and a smooth one – polyethylene terephthalate sheets – the next step for their work will be looking at the best ways to apply it to a wide variety of surfaces from glass to yarn and skin. "Further research on using materials from the MXene family in wireless communication may enable fully transparent electronics and greatly improved wearable devices that will support the active lifestyles we are living," Anasori said.